FuschiaTude and I, inuyashasama, are currently working on re-creating classic RISK in its entirety, including turn-based play and books. 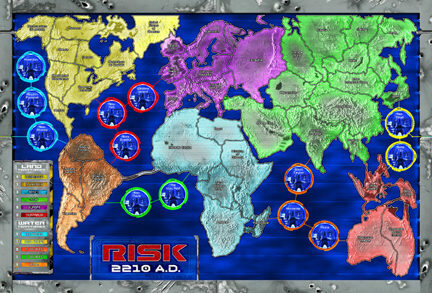 We then plan to add the Risk 2210 A.D. ruleset as an option at the start, which allows for colonization of the seas, the moon, and for the addition of commander units, action cards, space stations and more. The terrain for this project is now finished, but I'm always looking for testers and people to help with the coding. If you're interested, please send me a PM. Goals: [In Progress]Re-create the classic board game in its entirety. Add ability to divide Tanks and Hellions into marines. -Activate or De-activate "books" or "card armies"
Hey, I would like to make an apocalyptic sort of risk game and the terrain that FuschiaTude has made would be perfect! Do you mind me yanking it and using it as-is for my map? Will you be including the moon, space stations, commanders, command cards and the such?